Rich Strauss and Patrick McCrann, the Endurance Nation coaches, feel that the 2015 racing season was a watershed year for them, as both athletes and coaches. They learn just as much from watching their athletes as they do from their own training and racing…the combination of these two elements is a large part of what makes Endurance Nation so powerful and unique. 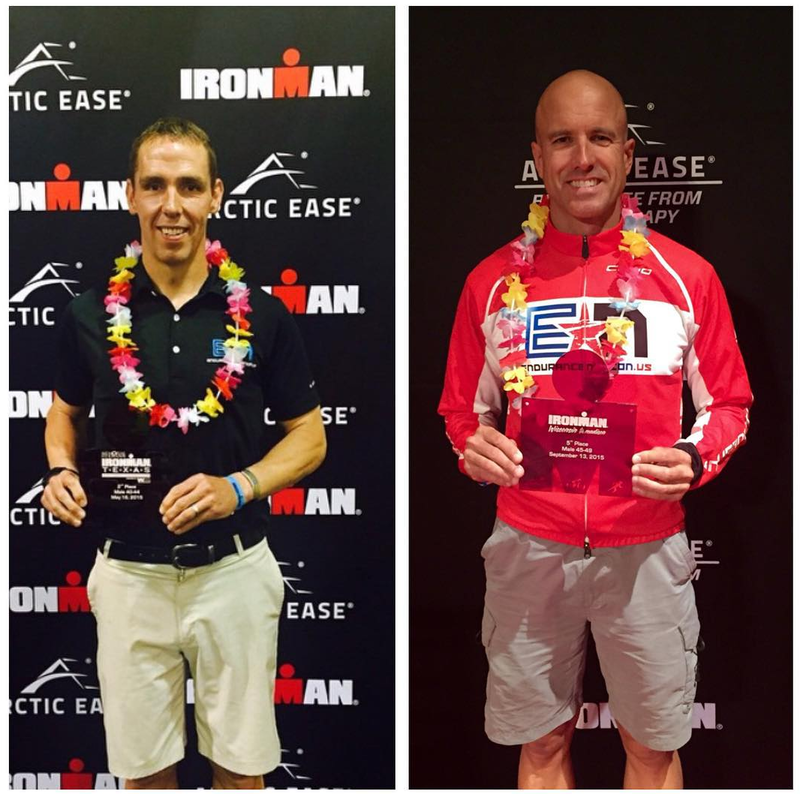 Coach Rich Strauss: 47 years old, returned to Ironman, after a 4 year layoff, and came within 2’ of his 2002, 34-year0old-self time on the same course, placing 35th OA, 5th place AG, and qualifying for Kona 2016. Coach Patrick McCrann: 41 years old, returned to Ironman Texas where he placed 2nd AG at the IM National Championship (within 2’ of his 2012 time), and continued to race his 7th IM Hawaii putting together his most complete race on the island netting him 60th place AG for his highest ever finish. En route to these performances they pushed the boundaries of age group training, racing, and experimentation, while at the same time teaching and guiding the incredible performances of their team. 2015 saw Endurance Nation — as coaches and as a community — learn many lessons. We will begin to implement them in the November OutSeason®, drilling those changes down further into the remainder of the 2016 season as we begin the process of putting as many TeamEN athletes as possible in the Front-of-the-Pack mentality (FOP). How Will the 2016 OutSeason® be Different? Aside from several actual workout changes and some new methodology, the most important change will be how you determine your OutSeason® start date. In the past this process was calendar driven — we helped athletes pick an OutSeason® start date by looking at (1) their most recent race, and (2) the date of the first important race of their upcoming season. For 2016, we will focus on Athlete Commitment and Personality more than what the calendar dictates. This season we are shifting that start criteria to “is the athlete mentally, emotionally and physically ready to manage the small details that go into creating a breakthrough season?” Your commitment plus a longer annual timeframe — starting with a full OutSeason® — increases your chances of success and improved race performance. As your coaches, we have a long list of items we work to (nearly) continuously improve upon, with that improvement process started, or renewed, in the OutSeason and extended across the remainder of the season. Our goal for 2016 is to bring a renewed, more detailed focus to as many Team EN members who are ready, willing and able. It’s clear that running durability and endurance, the combination of which significantly improve your ability to simply not slow down during the Ironman run, is just as (if not more!) important than raw running speed. It’s also clear that lean body composition is a significant factor in the success of our FOP athletes. They understand the value of attaining a “racing weight” and approach the topic as if it were the fourth discipline of triathlon. Another contributor to the success of the EN FOP athlete is the tracking of training data, with which they are more able to analyze their training and make better decisions about how to tweak their workouts to best suit their goals. This data is then applied in the Race Preparation Phase to the critical tasks of formulating race execution plans and processes. The pointy end of TeamEN has had great success with significantly boosting their cycling endurance through strategically placed high volume pops. It is more than just coincidence that you see the same athletes who attend our volume camps also succeeding on race day. And of course, our pointy end has taken the lead on refining our already excellent race execution processes, continuing to push the boundaries of smart, intelligent, disciplined racing. Finally, the pointy end leaves virtually no stone unturned in the pursuit of finding opportunities to go faster without working any harder: aerodynamics, bike setup, transition best practices and more. With so many of TeamEN athletes having recently completed their 2015 seasons, our intent is to shift the running in the upcoming version of the OutSeason away from making them faster and instead leverage their current fitness to make them more durable runners. We will do this by focusing on running frequency in the OutSeason plan. This will create consistent high frequency, relatively high volume running applied very earlier in their 2016 season. The make-you-a-faster-runner portion of your season will then happen after the OutSeason in a reworked Get Faster training plan. This marks a shift from the traditional OutSeason® training plan. We will be merging elements of the Run Durability Program (created in 2014) with the OutSeason…and shifting some of the higher quality, sustained efforts to the Get Faster plan. We will use the OutSeason as an opportunity to create and implement body composition improvement guidance, tracking, and accountability systems across the entire team, with the intent that all of us, as a Team, begin addressing body composition improvement months and months out from our 2016 race calendar. In the OutSeason® we’ll create a team-wide culture of logging and analyzing training data, yielding more impactful analysis opportunities for 2016. Custom High Volume Training Pops: We will offer training camp opportunities in Florida, California, the Tour of California and Blue Ridge Parkway training camps. And of course we’ll always support each athlete’s decision to roll their own opportunities, helping them schedule these camps for maximum effectiveness. Improved Regional Race Execution Camps: Both Rich and Patrick will tag-team the Northeast Regional camp in Lake Placid in June and the Southeast Regional Camp in Chattanooga in August, with an additional opportunity in SoCal lead by Coach Rich in July. Brand New Sneaky Speed Suite: We will consolidate and organize for you all of the trips and tricks we’ve learned through thousands and thousands of successful Ironman finishes. Finally, please understand that we remain, as we always have been, 100% committed to continuously improving the Endurance Nation experience: better plans, better resources, better community, better everything! We sincerely hope that this renewed focus on our part will give the Team the physical, mental and social edge they need to become their best. If you’re interested in training and racing with Endurance Nation – the world largest and fastest online triathlon team and two-time Ironman World Champion Triathlon Club – the OutSeason® is the best time to join our squad. when will you publish an IM plan with a day off each week built in? We have that plan internally for Team Endurance Nation members only already; we published it for the 2015 season. Thanks for asking! When are you releasing 2016 ironman season plans in pdf for non-members? Thanks. Mark no more PDF plans…Endurance Nation is 100% digital. All our plans are in the online store…the 2016 OutSeason® Plans are due to launch in just under two weeks!